On May 9th Axiall issued a presentation defending its position with regard to the hostile takeover move from Westlake and in anticipation of a potential proxy battle. It is a well-constructed presentation and obviously self-serving, but on the whole an appropriate stake in the ground. We have been constant in our view that we think this deal makes a great deal of strategic sense and that view has not changed, but it is clearly up to both parties to work out whether they can find common ground. 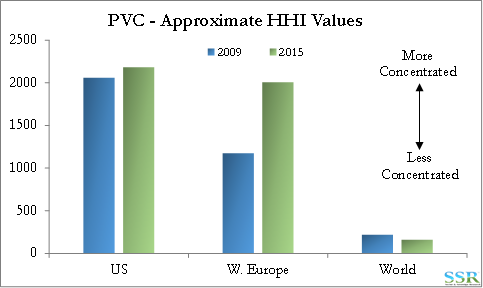 The chlor-alkali market and the PVC market are very oversupplied, with global operating rates at historic lows. In the charts below there is an assumption of no additions to capacity post 2016 and quite optimistic growth. While we see the leverage potential in Axiall’s earnings, we do not believe that a sustainable recovery in the space is possible without significant capacity closures in China and further consolidation in the West – best case without this would be 2020/2021 before a sustained improvement. The Wall Street Journal coincidently also on May 9th focused on the subsidies being granted in China to keep unprofitable, export oriented businesses running. The story focused on Steel and Aluminum but mentioned chemicals generally as another sector receiving support. Recognizing that Axiall is (appropriately in our view) open to a deal with Westlake, such a move would bring further consolidation in the West and might result in some capacity cutbacks which could shorten the down cycle. But – to be clear we think it very unlikely that Westlake is taking the view that adding to chlor-alkali and PVC exposure is some sort of panacea today for risk in polyethylene – opportunistic, yes – a chance to perhaps rationalized capacity, yes. We expect polyethylene operating rates to fall from the low 90s to the very high 80s – way above caustic or PVC today so the market dynamics are different. China remains a significant importer of polyethylene and should remain so for many years as demand growth is high and even with all of the coal based investment in China polyethylene capacity growth cannot catch up with demand. Consequently we do not have China as the “spoiler’ in this market. Polyethylene is the fastest growing ethylene derivative – probably 2x the growth rate for PVC and consequently will grow its way out of oversupply more quickly. However, the US may become the “spoiler” in this market given the massive investment coming on line from 2017 to 2020 and the need to export almost everything under construction. Polyethylene pricing in the US is likely to remain below global average pricing and the need to push more polymer into the export market is what is already dragging down pricing and Westlake’s profits. Lyondell and Dow have the offset of higher margin polyethylene in other regions today, but we do not expect that to last. Given advantaged gas prices in the US, we would expect lower polyethylene prices in the US, but still higher integrated margins than in Europe and Asia for the longer-term. Polyethylene margins in the US are much more levered to the relative price of crude oil and natural gas than PVC margins – if you believe the spread will widen over the next few years polyethylene is the more levered exposure. So, in short we agree with some of what Axiall is presenting and disagree on some of the finer points. Regardless, this deal makes a great deal of sense for both sets of shareholders – Axiall shareholders get some polyethylene exposure and cash and both Axiall and Westlake shareholders get to participate in needed chlor-alkali and PVC rationalization. It is likely an attractive deal to Westlake assuming higher synergies than Axiall suggests Westlake believes – it is likely unattractive at the level of synergies that Axiall suggests. Somewhere in between lurks a deal!